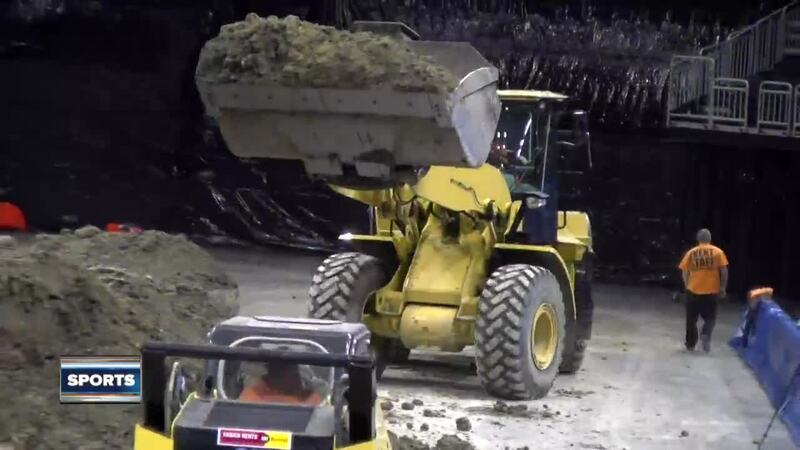 Fiserv Forum is the official home of the Milwaukee Bucks and Marquette Golden Eagles, but for the next two days it will be home to a thousand yards of dirt. Fiserv Forum is the official home of the Milwaukee Bucks and Marquette Golden Eagles. But for the next two days, it will be the home of thousand yards of sand. All the dirt is in preparation for Monster Jam. "We have a really tight time frame to get the dirt in the building. We hurry up, build the track in a day, get everything in the building, let the trucks come in and get set up and parked," Track Construction Manager Kenny Henry said. Once all the dirt is in place and the track is complete, the real fun begins. "It's a high adrenaline, big air, trucks rolling over and getting rolled over. It's an awesome time, great for kids and families and everybody else," Henry said. But let's get back to the 1,500 tons of dirt, because without it there wouldn't be a show. "The width, the height, the shape of the ramp and everything is all drawn up before we get here. Out operators that come in have to get it down to the very inch of everything so the drivers know what they are hitting each week," Henry said. Perhaps the most extreme thing about this extreme sport is that a crew of 40 guys will have to remove the 60 truckloads of dirt in the span of four hours to make sure that the Marquette floor can be put out in time for a nine o'clock shoot around Sunday morning for their fame against the Providence Friars.